Oh boy, there's a lot to talk about here. Most of it isn't good. Let's set technical issues and $100 in-game macrotransactions and disgusting chests-tied-to-mobile-companion-apps aside for a moment and just discuss Assassin's Creed: Unity as a game, because honestly that part isn't very good either. In many ways, Unity feels like an enormous step backward. Say what you will about Assassin's Creed III, but it was ambitious—multiple cities linked by a sizable wooded wilderness. Last year's Black Flag took that idea and expanded, crafting an enormous scale recreation of the Caribbean along with a dozen or so cities and towns to explore. But Unity takes things back to the Assassin's Creed II era. 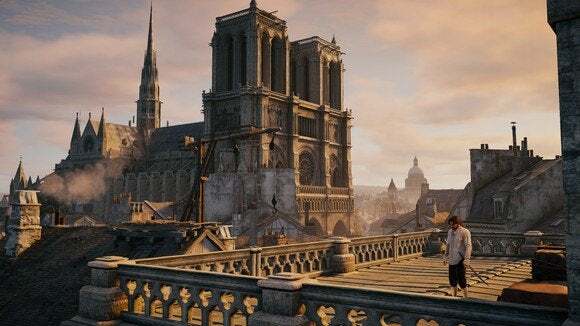 You're limited to exploring a sliver of Paris during the French Revolution, centered on Notre Dame, Ile de la Cite, and the Seine. You have the option of heading to nearby Versailles, but outside of a few story bits there's not a lot of reason to take the carriage ride. And that's it. This is a size discrepancy the likes of which I haven't seen since the transition from Grand Theft Auto: San Andreas to Grand Theft Auto IV. It's not all bad. The small scale has obviously allowed Ubisoft to focus its art efforts, meaning there's an amazing amount of one-and-done art. Notre Dame, for instance, is meticulously recreated. It's impressive how skilled these teams have become at reproducing real-world locations. The Unity team has also introduced seamless interiors to the series—an addition I don't think I can lose in the next entry. Being able to run up to a building, scramble up the wall, leap through a window, sprint through some poor dame's gorgeously-rendered hallway, and leap out a window on the opposite side is extremely impressive, to say nothing of just wandering through the corridors of the Louvre, Notre Dame, the Tuileries, and other Parisian landmarks. If there's anything Unity succeeded with, it's this. But overall the map feels small, and it turns out that Revolution-era France isn't that dissimilar from Renaissance-era Italy. 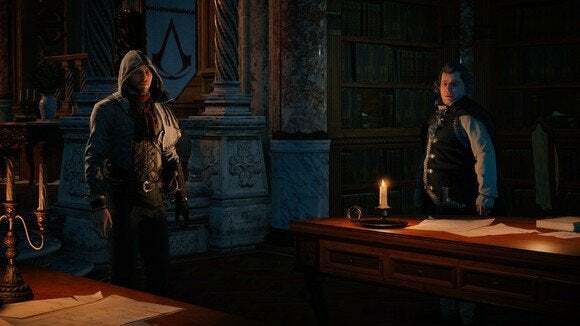 Add in the fact that your protagonist, Arno Dorian, looks and has the same cocky mannerisms as fan-favorite Ezio Auditore...well, Unity starts to feel like a retread. It's not helped by a story that largely avoids the complexities of the French Revolution. It's odd that a story set in Ubisoft's homeland feels so dispassionate about its subject matter, but that's what I took away from it all. 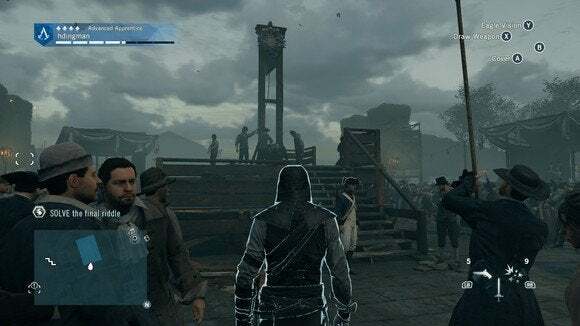 The Assassin's Creed series has long been a sort-of Forrest Gump tale where you just happened to be in the right place at the right time to modify history, whether it was palling around with Leonardo Da Vinci or tagging along on Paul Revere's midnight ride or helping George Washington fight the British or hanging out with Blackbeard. Unity, for whatever reason, largely abandons this pretense outside of some minor moments like waltzing through the Estates-General or even meeting Napoleon. The game feels more grounded overall, though, with Arno largely focused on his own story while the Revolution goes on in the background. Ubisoft clearly expects the city itself (and some of the side content) to tell the story of the French Revolution, as it slowly devolves from pristine Paris to an eternal garbage fire. It wouldn't necessarily be a bad thing to divorce the story from its Forrest Gump roots, as it allows for more nuance of character, but an unwanted side effect is that this game could just as easily take place in any period of history (say, Renaissance Italy) as in the French Revolution. 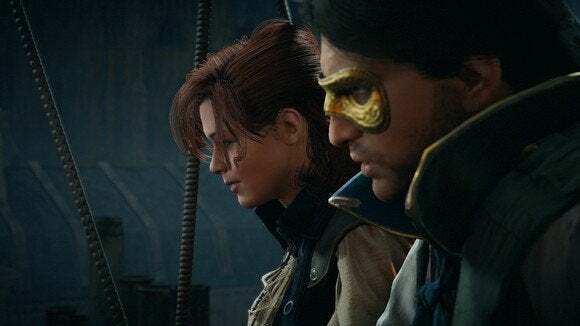 The main story of Unity is actually the relationship between Arno and his more-than-friend Elise, a red-haired girl from his childhood who he's grown up and fallen in love with. These two characters and their shifting relations is the heart of Unity, and it's well-executed. There's a lot of depth to the relationship between the two, and it's treated with a seriousness the likes of which most video game romances don't reach. As I said, though, it doesn't do anything to ground the story in the French Revolution, unlike the relationship between Edward Kenway and actual historical figure Mary Read in Black Flag. And if you were upset with Black Flag because the modern-day storyline was given short shrift, you'll be livid with Unity. The modern-day setting is dismissed almost entirely in this game. They even got rid of Black Flag's first-person exploration sections, which personally I enjoyed. Instead you... watch videos. And once every two or three chapters hear some (brief) voiceover. To crown it all, the game doesn't play as well as previous entries (and I don't even mean from a technical standpoint). If you asked me what one thing I'd like to see changed with the Assassin's Creed franchise, the free-running would've been pretty low on my list. It needed refinement, for sure, as you occasionally had the "Oh damn I just jumped off this twelve story building by accident" moments. For the most part, though, the free-running was a stand-out feature. Unity, for whatever reason, overhauls the parkour and splits traversal into two separate Ascend and Descend buttons. The new system sounds great on paper but is horrible at context, and often I got stuck on the side of a wall trying to figure out what combination of buttons to press to get Arno to move again, or stuck on the edge of a two-foot tall box trying in vain to get Arno to jump off it. If anything, the controls now feel less responsive than they used to. Get used to glitches if you pick up Assassin's Creed: Unity. 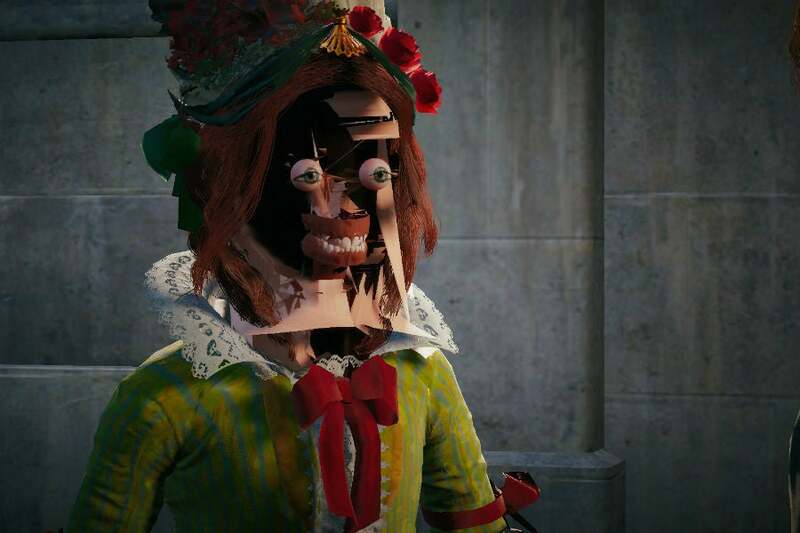 Making matters worse, Assassin's Creed: Unity suffers from numerous damning technical issues. It's a mess. But instead of dwelling on the number of hardlocks/crashes I experienced in my time with Unity (over a dozen), as well as the enormous number of graphical glitches I witnessed, I'd instead like to discuss Ubisoft's minimum specs for this game in relation to the overall PC hardware landscape. The minimum specs for Unity have met with quite a bit of controversy, and for good reason—Ubisoft requires at least a GeForce GTX 680 or above. To give you an idea how many Nvidia cards this includes, we're talking a 680, 770, 780, 780Ti, 970, 980, and the Titan and Titan Black. It doesn't even include one-generation old cards like the 750, 750Ti, or 760. For minimum specs. I went ahead and plucked numbers for both the supported Nvidia and AMD cards from October's Steam Hardware Survey. 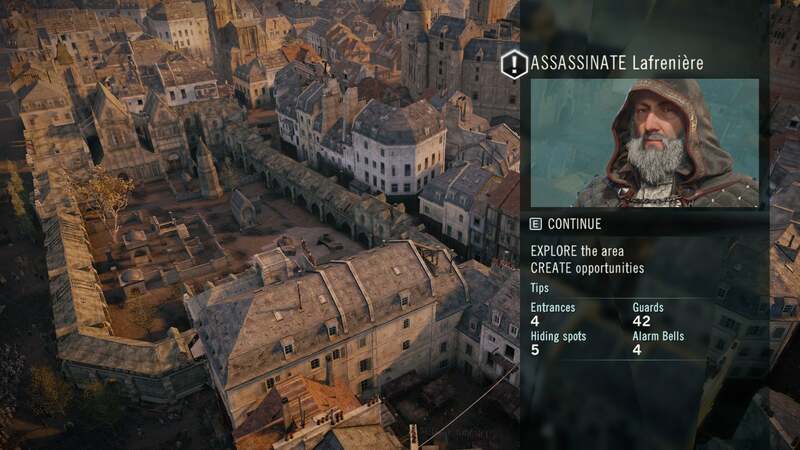 Want to know how many Steam users run a card officially supported by Assassin's Creed: Unity? Approximately seven percent, give or take a bit. Now, this wouldn't be such an issue if Assassin's Creed: Unity were a PC-first game a la the first Crysis. "It's future-proofed. Just wait until five years from now when everyone's upgraded—Unity is going to look beautiful and run even better!" No, this is a console-first game. Running on consoles, I might add, that feature the GPU equivalent of AMD's 7790 (Xbox One) and 7870 (PS4) cards. If you're an Nvidia household, the 7790 is equivalent to Nvidia's 650 Ti Boost, a.k.a. a card not even close to the performance of the "minimum spec" 680. Even accounting for the differences between PC and console hardware, Unity is nothing but a borderline-offensive PC port. It hiccups even on high-end setups, and it's not optimized well enough to run on not just low-end but average hardware. 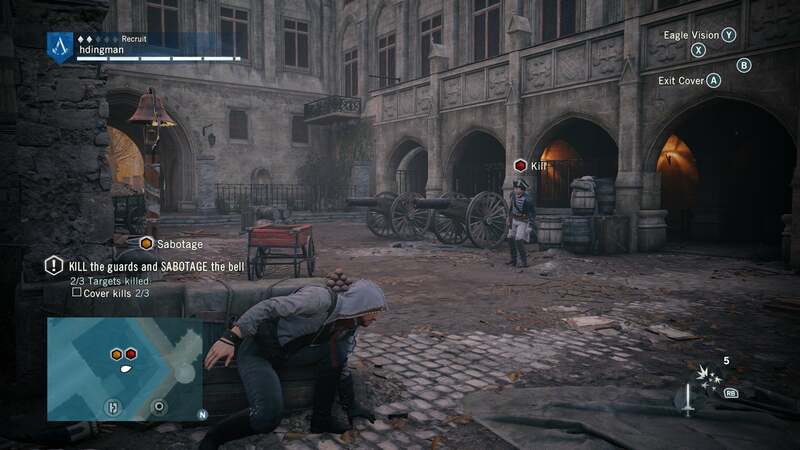 The main culprit is almost undoubtedly the enormous crowds Ubisoft has crammed into Unity. Back when I saw the game at E3 I said that having 5,000 people on-screen at once without cheating was "an absolutely baffling number of people." It turns out I was right to be incredulous: Ubisoft crams 5,000 people on screen and, in doing so, completely breaks the framerate. At least on the PC we can upgrade hardware—I feel even worse for people on consoles, who are hitting sub-20 frames per second at times with no chance for recourse. What's more, these crowds don't really do much. It's impressive from a purely technical standpoint, but from a game standpoint they still mainly exist to get in your way as you run through the streets. 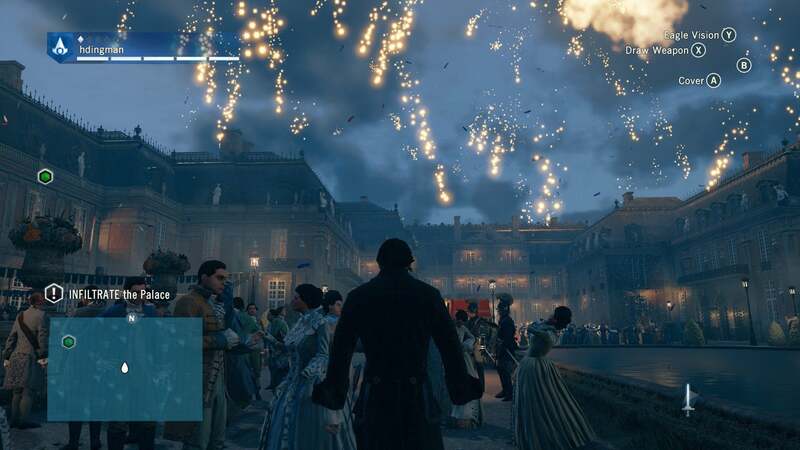 My favorite thing is how they walk over dead bodies you leave in the street as if the bodies aren't even there—whether that's dumb AI or a subtle commentary on the sheer amount of death in the French Revolution, well, I'm not making any wagers. Unity serves as one more reminder (as if we needed it) that yearly development cycles are a problem—not just because of the quality issues, but because Unity shows a company unable to pivot. I'm sure prior to Black Flag's release, when Ubisoft was served a big ol' plate of derision over "Assassin's Creed with boats," Unity probably seemed like a great idea. It would be a return to the so-called glory days of Assassin's Creed II and Brotherhood. The problem? Black Flag was a surprise hit—easily one of the best games in the franchise. It was too late for Ubisoft though, which was forced to finish Unity. There's no way the game could be overhauled with only a year left. So we were fed the "It's a return to our core tenets," line, as if it was some rogue team at Ubisoft that made Black Flag without the support of the "real developers." It's the same problem Call of Duty fell into, with the so-called "good" release coming out one year and a more ho-hum entry playing catch-up the following year. 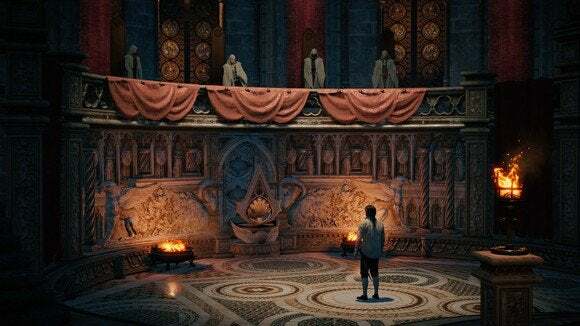 Unity, in many ways, feels like a sharp downgrade from Black Flag, stripping out almost everything that made that game laudable and addictive and replacing it with... well, Assassin's Creed II. As if we hadn't already played two direct sequels to Assassin's Creed II. And even that wouldn't be too bad—probably a 7/10-style "been there, done that"—if the game weren't such a slap in the face as a PC port. As things are, this is a new low for the Assassin's Creed series.